TOYS OF LEGEND Now Featuring: R&L's King Crater! King Crater, that is... my introduction to his regal presence was in 1971, at the tender age of seven. By then, I had learnt through observation that you should always try to get your mother to open the cornflakes box at the bottom. That's where the prize usually was. And I can still remember the excitement when my first royal critter, encased in his protective cello time capsule, tumbled playfully into my breakfast bowl. That was it. 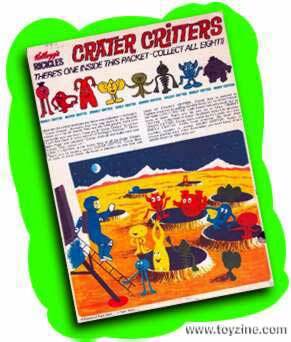 I was hopelessly addicted to the pursuit of Kellogg's secret cereal-marketing weapon... Crater Critters. By age 8, things had gotten weird. I can't erase one scary image from my childhood, no matter how hard I try... the towering figure of the local greengrocer, powerhouse arms folded, staring piercingly at the little guy kneeling on the pavement. Surrounded by the wreckage of four Froot Loops boxes, I had nowhere to go. Never fear, the cereal had been honestly acquired. At that time, my entire weekly allowance was being blown on cereal... cereal that I didn't eat. The greengrocer had finally caught the kid who had been regularly leaving vandalized cereal boxes just around the corner from his store, and boy-oh-boy, did he let me have it. Wasting good food, leaving a mess... guilty on all counts, your honor. Seems I was so overcome by the lure of these plastic critters that I couldn't wait til I got home to open 'em. As I said, hopelessly addicted. Made by Australian company R&L (Rosenhaim and Lippmann), the Crater Critters were successfully distributed worldwide inside Kellogg's cereal boxes in the late 1960s and early 1970s. R&L made plastic cereal premiums both before and after them, but the critters were without a doubt the most-loved and fondly remembered. There were eight in a full set (ten if you count the legendary Japanese critters... but then that's a story for another time), and were typical of R&L's inspired-lunatic artistry. Fabulous in color and texture (soft lime greens, soothing lilacs and striking oranges, all set in a malleable waxy plastic), they could not fail to appeal to their target audience... kids like me. And kids like me everywhere were not happy until we had completed the set. The hardest to find even way back then was King Crater. This original scarcity, combined with his fragility factors (No. 1 being the impossibly delicate and begging-to-be-removed crown structure), has resulted in his being an even more highly-prized collectable 'prize' today. Mint specimens with perfect crowns currently fetch 150 and up, with price dependent on colour variations. So take a hike, Tooly Birds! Quieten down, Quisp! Flake off Freakies! Hail to the King! Long may he reign over all cereal premiums.